Capt. 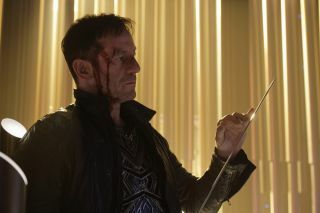 Gabriel Lorca (Jason Isaacs) takes up a sword in the course of his rebellion in "Star Trek: Discovery" Episode 13, "What's Past Is Prologue." Warning: This review includes spoilers for Episode 13 of "Star Trek: Discovery." Last night's (Jan. 28) "Star Trek: Discovery" was an old-school-style episode full of weapons firing and people yelling inspirational speeches. In the episode, "What's Past Is Prologue," the USS Discovery crewmembers initially believe they will die but instead end up with a satisfying way to use an explosion to get a ship moving really, really fast. There's a lot of action to unpack in Episode 13, so let's get started. By the episode's end, however, Burnham once again proves her officer quality by defeating Lorca in, of all things, a knife-and-sword fight. She gets a bold assist from Georgiou, who stabs Lorca in the back and throws him into the Charon's machinery (through a conveniently placed door that is presumably used to toss folks away on a regular basis). Before we go any further, let's go back to the events on the USS Discovery. Discovery is in a pickle of its own. The real-universe Stamets is healthy and able to operate the spore drive, which will transport them out of this alternate-universe craziness. But the crew knows that the Charon's misuse of the mushroom-spore network is harming both the alternate and "real" universes. If the network degrades completely, life in both universes will cease to exist, we're told. They can't just simply jump away — so how can they solve the problem? There's a lot of confusing engineering talk, which is typical for "Star Trek," but essentially, they decide to blow up part of the Charon's engine to restore the spores. At first, the crew calculates that the blast is going to kill not only the Charon but also the Discovery. Saru (Doug Jones) assures the crew that his species usually can sense the coming of death, but not this time — somehow, they will survive. "We have a duty to perform, and we will not accept a no-win scenario," Saru says to the crew, who responds with a hearty "Ay, captain!" Because Saru is a truthful sort, the crew believes him and tries to come up with alternatives to death. Finally, they devise a creative solution. They'll still blow up the ship but will attempt to ride the wave of the explosion to propel themselves back into the normal universe. The Discovery crew is ready and waiting, when Lorca is thrown into the door on the Charon and killed. Georgiou tells Burnham that she is a disgraced emperor with no hope of returning to power, and thus will buy Burnham "a few minutes" while Lorca's very angry soldiers attack (which would presumably lead to Georgiou's torture, death or both). But when Burnham gets her lift back to the safety of the Discovery, she pulls Georgiou into the transporter beam, and the two arrive on the ship. Georgiou is not happy — "What have you done to me?" she asks Burnham — but everyone knows it's too late to change the situation. After the Discovery blows up the engine, Stamets navigates the crew back to the normal universe. Turns out, they made it back to the right spot, but they arrived nine months after their disappearance. We find out that it was just enough time for the Klingons to win the war. Can the Discovery travel through time again, or will the crew find a way to reopen the battle? Is this an opportunity for Burnham to practice her new negotiation skills from the alternate universe and broker a peace deal with the Klingons? There are two episodes left in the season, and a lot of questions remain about where "Star Trek" will take us next. It's been a hectic few episodes, so the future is very hard to predict. I can't wait to see what's next. The next episode of "Star Trek: Discovery" goes live on CBS All Access around 8:30 p.m. EST Sunday (Feb. 4). You may see a door in the ship's floor leading into the spore drive, but I see the moon door from "Game of Thrones." Just saying. The name of the episode — "What's Past Is Prologue" — is a reference to the William Shakespeare play "The Tempest," which takes place on a magical island. I guess it's the Shakespearean equivalent of an alternative universe. Speaking of alternate-universe craziness, we got another cameo from Battlestar Galactica's Rekha Sharma, whose real-universe counterpart, Cmdr. Ellen Landry, died early in the "Discovery" season. All that talk of the "no-win scenario" made me think of the Kobayashi Maru — the infamous test for aspiring Starfleet officers in the original series (1966-1969). That was also a scenario that cadets weren't supposed to win, because it taught them how to deal with loss. Cadet Sylvia Tilly (Mary Wiseman) has really toughened up in the alternate universe. Because her alternate-universe counterpart was a captain, she was forced into the role of captain when talking to the Terrans in order to disguise the Discovery. Acting as a captain really did wonders for Tilly's confidence. She's more assertive with her fellow crewmembers, and let's not forget she played a key role in bringing Stamets back to his normal self. Assuming the writers of "Discovery" don't have an outstanding loophole to bring him back, I am going to miss seeing Lorca and Isaac's outstanding performance. As viewers, we knew from the beginning that Lorca was a captain with a troubled past. He wasn't afraid to buck Starfleet's rules, and he had some interesting musings on fate and destiny. He was quite different from other starring captains in the "Star Trek" franchise, and I enjoyed the never-ending game of figuring out his intentions. On a related note, it's a joy to see Georgiou back with us for the time being, because I love how tough she is. I know that Yeoh is listed as a guest star for now; I hope that, at the least, she'll appear as a recurring character. But considering how many characters have died this season, who knows? There was something really satisfying about seeing the final battle scene that involved swords and knives. Not only was it odd to see something so medieval in a futuristic franchise, but it also reminded me again of the recent rumors that Quentin Tarantino (whose movies involve all sorts of this stuff) will direct the next "Star Trek" movie. I know, different universe, but it still made me smile. Follow us at @Spacedotcom, Facebook or Google+. Originally published on Space.com.